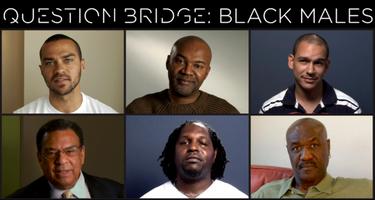 OPENING RECEPTION: Wed, Feb. 6, 5-7 p.m. Mary Porter Sesnon Gallery, UC Santa Cruz - FREE and open to the public Question Bridge: Black Males is a collaborative multimedia project in which over 150 black men—from across the United States and also across age, class, profession, and sexuality— together explore some of the most troubling, poignant, personal, and sometimes incongruous aspects of their lived experiences. Shown as a five-screen installation, Question Bridge,/b> utilizes multiple platforms to facilitate a conversation between participants who ask and respond to each other’s questions. The result is a deeply insightful, emotionally layered conversation, which delves into the depths of the private lives and social concerns of diverse black men across the U.S. Gallery hours: Tuesday– Saturday noon to 5pm, and Wednesdays until 8pm during the academic year, or by appointment for special tours. Closed for all University holidays and the summer months.